Does paying a higher premium for U.S. Silver Eagles versus generic silver rounds make sense? Sometimes it does. Silver Eagles are generally priced with a higher premium, but depending on the premium difference, your time horizon and your purpose for buying silver, Silver Eagles can have a lower “cost” compared to silver rounds. Paying a higher premium for Silver Eagles can be justified if the difference in price is reasonable. The return on an ounce of silver via Eagles can be higher than that of silver rounds, despite the higher purchase cost. It all comes down to the ultimate sale price for the Silver Eagle or Silver Round. It really doesn’t matter that both options are comprised of 999 silver. Your round trip transaction cost for both the purchase and sale of your silver is what matters. In PMBull’s guide to silver bullion, we discuss how and where to buy silver at the best price. The objective of the guide is to identify good dealers with low prices and how to compare dealer premiums over spot silver prices. Buying silver at the lowest possible cost allows you to maximize the amount of silver purchased. If maximizing the amount of silver you acquire is your objective, you might conclude that choosing lower premium generic silver rounds over higher premium government coins like American Silver Eagles makes sense. Is maximizing the ounces of silver one holds a reasonable objective though? What about maximizing the value of your silver stack instead? The question that needs to be answered is whether or not Silver Eagles are sufficiently more valuable than a specific silver round to justify the higher price at the time of purchase. A silver buyer preparing for a currency collapse, hyperinflation or a financial system reset might choose to buy the cheapest precious metals with the lowest possible premium over the current silver spot price that he can find. He may do this because he believes there will be no difference between coins and round prices under these circumstances. An ounce of silver is an ounce of silver, regardless of the design engraved into it, right? PMBull has found 10 ounce silver bars to be a favorite amongst its visitors. Silver buyers appreciate the 10-ounce bar format available at most dealers because they offer convenience, beauty and good value, putting these bars at the top of the list in bullion buyer reviews. Stackers choose 10 ounce bars because they are produced by virtually all of the high quality, trusted mints. They look good and feel good in your hands and are exceptionally convenient to store. Since they are packaged in clear, protective plastic at the mints from where they are produced, they remain beautiful and maintain a nice, shiny luster. You can find good dealers for 10 Oz. bars with tips on buying silver bullion in PMBull’s guide to buying silver bullion online. In the guide, we review the best types of silver for new investors, discuss how to calculate premium over spot price and look at several silver rounds, bars and coins from top online silver dealers. 10 ounce silver bars vary in size from mint to mint. Generally, three 10 oz. silver bars are similar in size to a deck of playing cards (but of course will be much heavier). They fit neatly together, even when retained in their mint plastic. Four 10 oz. bars, when stored properly, can take up less space and may be easier to stack than two mint tubes of Silver Eagles or 40 random 1 ounce silver bars. Johnson Matthey bars are known to be of exceptional quality, are IRA approved and include serial numbers. While no longer in production, Johnson Matthey new and secondary market bars can be found at the dealer linked above. These bars command a premium due to the iconic status of Johnson Matthey as a retail precious metals refiner during their great run. We’ve added additional silver round pages to our silver bullion guide, where you can find the best prices on a variety of silver bullion coins, rounds and bars. We’ve included the videos for these rounds below, but encourage you to click-through to the full review pages for more information on them. OPM Silver Rounds: More Bullion Per Buck! The next video features OPM Silver Rounds, which are a great choice for those seeking the lowest cost option, but do not wish to sacrifice quality. OPM is the largest precious metals refiner in the U.S. and produces a wide variety of gold and silver bullion. Get more information on OPM Silver Rounds, including buying tips, best price dealers and reviews, on the OPM Silver Rounds page. Sunshine Minting Silver Rounds: Security in a Seal! This video shows off the high quality Sunshine Minting Silver Rounds, which feature anti-counterfeiting technology. Sunshine is one of the most respected and well recognized mints in the world, producing some of the highest quality silver rounds on the market. The amazing thing is that these rounds, brand new and complete with the anti-counterfeit seal, are still priced lower than many generic rounds selling in the secondary market or on auction sites. For buying tips, best price dealers and reviews, see the Sunshine Minting Silver Rounds page. As part of our ongoing expansion of content in PMBull’s Physical Bullion guides, a new page dedicated to Buffalo Silver Rounds has been released. On this page, you will be able to view pictures, descriptions, reviews, mint notes, buying tips and recommended dealers. 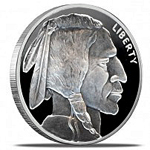 As one of the most popular rounds, the Buffalo is the first in a series that will be addressed in more detail on PMBull, through our Physical Silver Bullion pages. PMBull visitors will be able to provide their own reviews, including video, as well as tips for buying, mint notes and images. Visit PMBull’s Silver Bullion guide for tips on finding the best price dealers, or see our recently released Silver Rounds section, where we list some of the most popular dealer offers today. We will continue to provide more review pages for each individual silver product and note them here. As always, you will still be able to view live, 24-hour Spot Silver and Spot Gold prices on each of their respective pages, where the most popular physical bullion products are listed, along with news and commentary on the precious metals markets. We hope you like the information we provide and if you do, please drop us a note at our contact page, linked in the footer of this page. Stay tuned, as PMBull will continue to add more content and information on Gold and Silver markets and products. Many PMBull visitors have made use of our silver bullion guide, where we discuss finding the best silver bullion at the best price, from top online dealers. The guide addresses basic coins, rounds and bars. PMBull also lists top daily silver dealer offers on its spot silver page. There, we try to present the best priced dealer offers on the more popular coins, rounds and bars. Many PM stackers enjoy collecting silver rounds in addition to accumulating pure silver as an inflation hedge, or as insurance for an economic collapse, so we have decided to provide links to some of the better designs and mints in a standalone silver rounds guide. This section is linked from our primary physical silver bullion guide. In addition to listing some of the better designs and popular mints, we discuss the differences between collecting rounds and investing in silver coins or bars. We also present good dealers for finding new silver rounds for your collection. The number of silver rounds presented in this guide is currently limited, and may vary from day-to-day, as we find new selections that we think are worthy of consideration. We will be adding more mints and designs soon. If you haven’t yet looked at PMBull’s guide to Silver Bullion, please do so, and check out the new Silver Rounds Guide while you are at it.